Now, it's World Cup time and it's back with a pretty sweet update that still lets you play with balls! The tournament is going down right now in Brazil – with the hosts kicking things off in style in the opening game – and this live wallpaper is just the ticket to help you cheer on your team! So, what's new this time out? The 2D view of old makes a return accompanied by a brand new 3D view that represents the legendary Maracana Stadium in Rio de Janeiro. As you swipe around between your different homescreens the view rotates around the stadium. There's also a "Battle mode" which is a little confusing, and just seems to be the same thing but tied into a range of adidas football footwear. You can still tap the football around the screen as before in 2D mode, while in 3D you get to take a shot at goal. Once you've chosen your favorite team – go England! 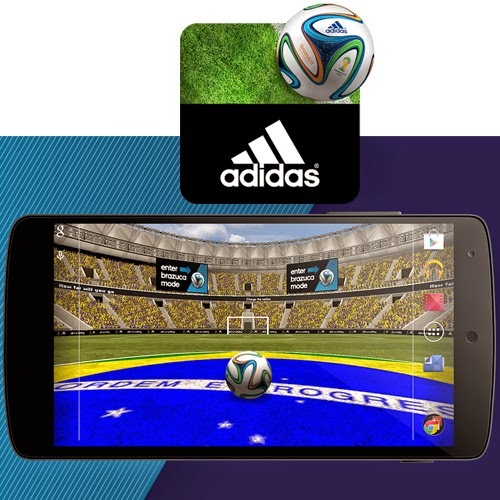 – you'll get a nice big flag in the center circle and also new for this year is the Brazuca clock widget. It's a free download so head on over to the Play Store at the link up top to grab it for yourselves. Be sure to leave us a line in the comments and let us know who you're shouting for this year!